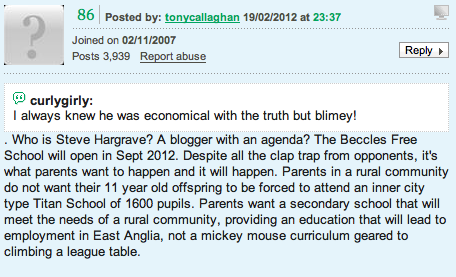 Despite a strongly worded statement from the Seckford Foundation that makes it completely clear Tony Callaghan is no longer involved in the Beccles Free School bid he is still continuing to post on the TES Forums about the school. Last night he apparently returned from a cruise to the Virgin Islands and hit the TES forums. After his attention was drawn to this blog he then posted saying the school would definatley still open and "provide an education that will lead to employment in East Anglia, not a mickey mouse curriculum geared to climbing a league table". The Seckford foundation's attempts do not appear to have succeeded in stopping Mr Callaghan's comments. And I don't even think Sir John Leman will end top with 1600 pupils due to the opening of Pakefield High in Lowestoft but even if it does the popular Farlingaye High School - interestingly in Woddbridge is so successful that it came 8th in the country with its A-Level results. It it is giving the Seckford run Woodbridge School some competition! With almost 2000 pupils it is still oversubscribed most years.